NOAA had issued a G1 geomagnetic storm warning for March 6th due to CIR/solar wind stream disturbances which would likely generate auroras over the weekend. I was fully aware of the potential and what CIR regions were capable of however for some reason I wasn't convinced with this set up, I decided that in all likely hood I would give this aurora a miss as I suspected it could be a damp squib or else not good enough to get my full attention, in truth what I meant was that I couldn't justify a trip to the coast financially for a glow on the horizon, I was holding back for something bigger and besides, it was Mother's Day also and we had to do our visits as well so it looked like this was going to be a non event for me on a personal level. However that being said I brought my lap top with me so I could keep an eye on the charts just in case, daylight hours were damp and cloudy however a clearance was expected later in the evening so the timing was looking good. Roisin and I visited my Mum in Maghera then later we arrived at her parent's home in the countryside near Staffordstown road outside Toome. We spent the rest of the evening there and while dinner was cooking I checked the charts and was surprised how good they looked, the oval was large and yellow with a southerly Bz of around -3 or less, the wind speed wasn't fantastic though but based on the charts I knew there would be an aurora of some kind for those who made it to the coast. For me it was not strong enough and I wrongly assumed the Bz would climb back N again causing the aurora to subside which is what it had been doing a lot recently, so I switched off the lap top and spent a relaxing evening with Roisin's family. It's hard to move when you are in front of a warm roaring fire, in fact, several times I almost fell asleep, I was that relaxed, but not only that I was exhausted too so I was happy to spend my evening in this state and for once my mind had drifted from sky phenomena to watching what was on the TV. Something was brewing though and I was unaware of it, I was also unaware that I had been getting missed calls and texts from other photographers tipping me off to something big happening, this was because the phone signal is very poor in this area so I never got a signal one of them on time, that is except one missed call from photographer John Fagan which got my attention, I knew John wouldn't ring unless something impressive was happening in the sky. It was 21.30 and Roisin and I got up to leave anyway to head back to Cookstown so we left the warm comfort of the open fire, opened the front door, and stepped out into the freezing air which smarted my eyes and senses in an instant. 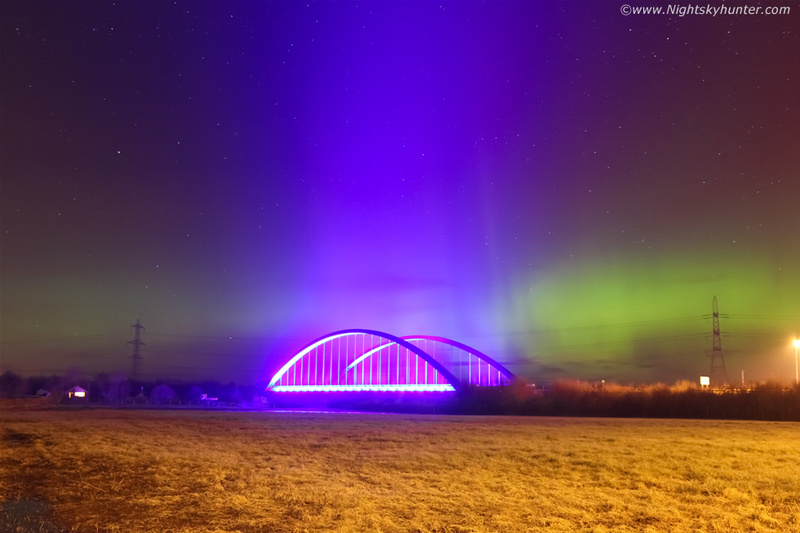 The night was dark and full of winking stars with frost in the air, I turned to my half right towards the N and saw an aurora before my eyes were even adjusted to the dark, I shouted ''holy s**t, aurora!!!''. Roisin and I walked into the yard for a better look. I was shocked to see a vivid green glow in the sky extending NE to NW and within the NE sector was two tier structure, by that I mean two levels of bands/arc which is normally a sign of a strong aurora, at this time the aurora was in the process of evolving into a full G2 geomagnetic storm which was much more significant than what was forecast. 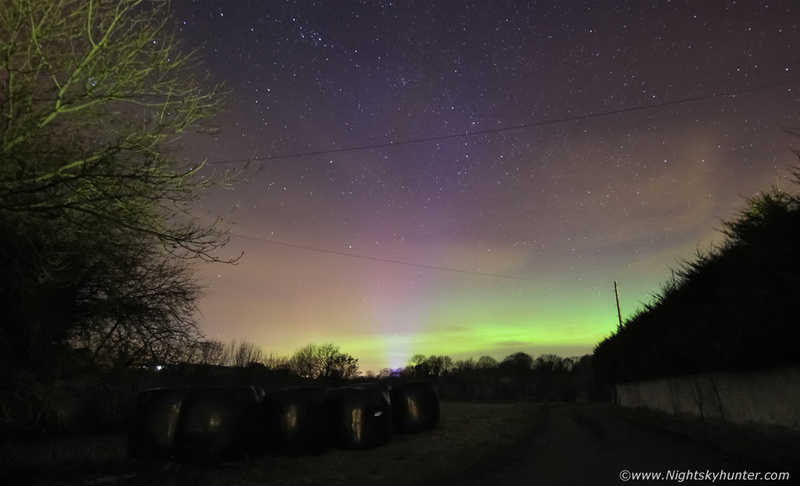 Roisin's Dad Cyril came out for a look and together we watched the sky, both of us saw several pillars of light forming and reforming above the band, I just knew by looking at the visual profile that this aurora was about to go into a major outburst at any moment. I grabbed the camera from the van, got it set up, and took a couple of test exposures so I could show Cyril what the aurora looked like on camera in comparison to the naked eye view, you can see the blue lights from Toomebridge also. I needed to think fast, this was about to kick off in a major way, I needed somewhere in the local area that had good foreground, Roisin suggested Cargin chapel on the Staffordstown road, that was the chapel we got married in so it was a great idea so we wasted no time hitting the road. We stopped at the chapel and realised the angle was wrong, the most impressive part of the aurora was to the right of the chapel in the NE so once again we wondered where to go, I said ''Toomebridge''. I knew this was a long shot and unlikely to work, I had tried G1 storms before with the bridge and it never worked out, there is so much light pollution from the bridge and the adjacent road that the aurora would be washed out, furthermore if you cut the exposure down just to shoot the bridge the aurora wouldn't show up much at all, yet for some reason my instincts were urging me to go there and I felt a confidence stirring inside me which I knew from past feelings that I was making the rite decision. We arrived at the bridge and got parked near a gate, I tried to climb over the gate but the metal was covered in ice, it was slippery even to touch, the van was already reading -2 degrees C and frost hung in the air. I used the wire fence at the side and got over the gate and landed in a muddy field, but I didn't care for just when I took my DSLR out from it's bag the aurora went into a sunning outburst, the time was almost 22.00 UT. 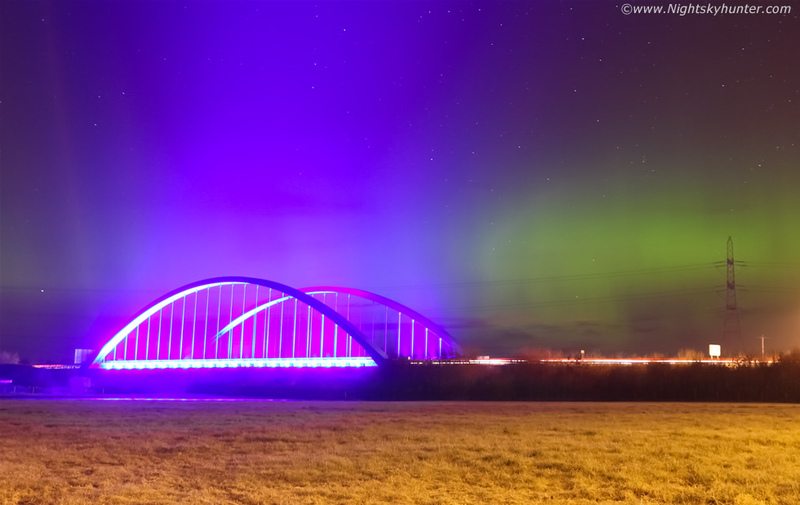 This was the scene I never thought I would get, the aurora was so bright it came out perfectly and the bridge lights even complimented the view. This was 10mm wide angle, it took me a few goes to get the exposure balance correct, the scene was challenging so trying to capture everything on camera without major blow outs was tricky, I found that ISO800 worked well and kept things in check while making for a cleaner image, I was using exposures in the 18- 20 sec range. 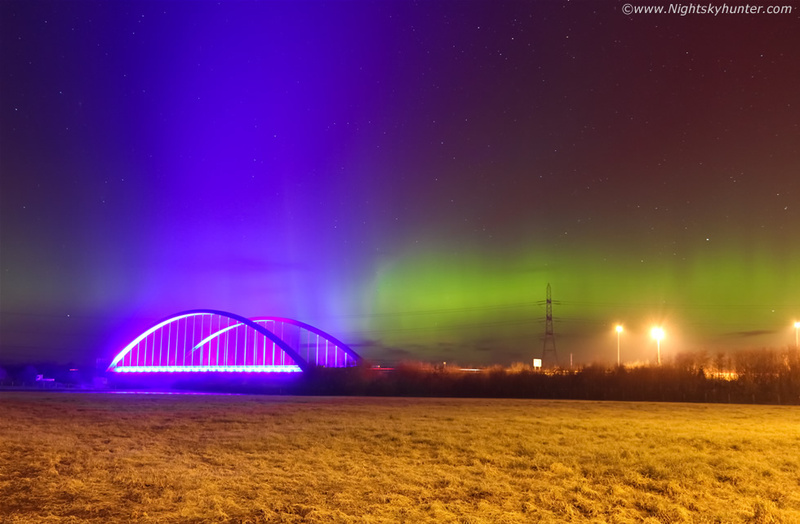 What an awesome view it was, seeing a strong naked eye aurora over this famous landmark really was a thrill to experience, I shouted to Roisin to come out and look, she saw the beams too and was amazed, I think the experience was even more rewarding for her because this was her home area. I attached the 18-55mm lens which got me in closer and made for a nice composition. With the naked eye I could see a multitude of green rays which were so intense they were clearly visible above the streetlights lining the carriageway. Above the green was a vast formation of red colour which in this image extended just as high as the blue lights from the bridge, we could see this red colour with the naked eye no problem, it was like the colour of red wine. The green vertical rays reminded me of streaks of angel hair being combed upward by some unseen hand but what impressed me most of all where the naked eye beams which danced from right to left past the famous bridge, these rays were so bright they were visible above the bridge and even THROUGH the blue lights of the bridge, this was a first for me, I had never seen such a bright aurora over Toome before, I was instantly delighted we had made the decision to stop here. 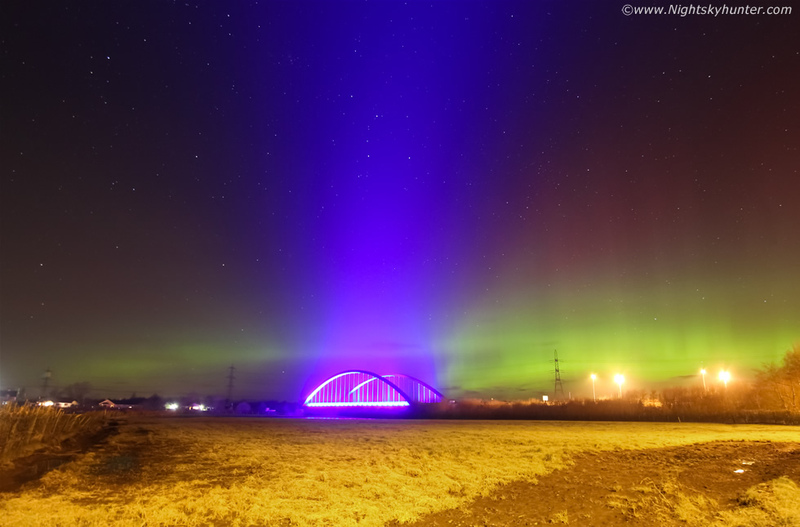 What a beautiful combination of colours from the red and green of the aurora to the yellow and orange streetlight glow on the field to the blue, purple and magenta colours of the bridge itself, there are also car trails on the road too. A crop closer in to the bridge, I was bouncing lightly on the spot in the mud trying to keep warm, the frost was thick in the air and it was absolutely freezing, we could hear some bird in the hedge beside us making cute noises the entire time which made the experience even more surreal. 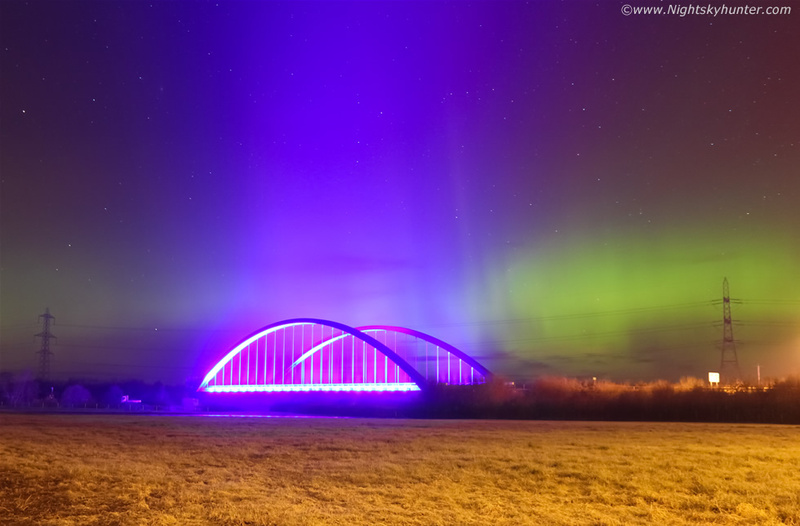 The Bz must have been far S at this stage and I found out later that the auroral oval was blood red and that this aurora was being seen from al over Ireland, even as far S as Cork with reports even coming in from Belfast too. 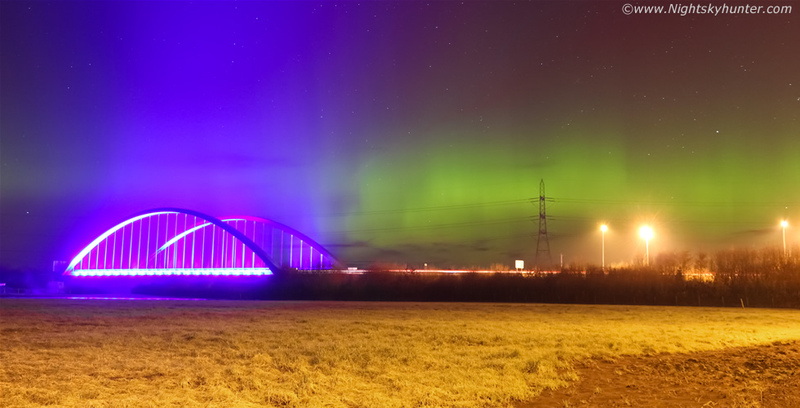 Observers from dark locations were seeing bizarre blobs and patches of light far extended from the rays and even reports of corona forms further N, the event was being photographed from all across UK and Ireland and what was the best aurora since the St. Patrick's night display of 2015. I cropped this one into a pano style, I was talking to the sky shouting ''yes'', ''holy s**t'', ''wow'' then the outburst eased and the aurora returned back to it's green glow, that outburst must have only lasted approximately 15-20 min's so our timing was amazing, had we stayed in the house 20 min's longer we would have missed the entire outburst, but we didn't miss it, this show was meant to be and what a wonderful unexpected surprise it was on Mother's Day. A good lesson for new aurora hunters is to never underestimate the potential of what a Counter Rotating Interaction (CIR) region can do, especially so when the Bz is south, this is a set up to remember for the future. Later after midnight I could still see the aurora over the rooftops from Cookstown, the show stayed at storm levels for much of the night and NOAA even discussed the possibility of upgrading it to G3 level, however we were more than happy with what we saw, this aurora made our entire weekend and we even spent the days ahead glowing from that wonderful feeling one can only get when Mother Natures shows off on Mother's Day. Thanks very much for reading.